Distillation is sometimes the only possible for of treatment to purify water. After disasters and during emergencies there are times when there isn’t enough fuel for boiling, or there isn’t a suitable container available to place over an open flame. In a true end of organized society situation or even just disruptions to the supply chains, replacement water filters will not be available and new supplies of disinfection chemicals will disappear. Even backup sources of water need to be disinfected. This is something everyone with have to deal with and a small solar distiller can be built by anyone. Solar water distillers can be created using household items. What you need is a clear glass pot or bowl. As long as it is oven safe. A cup, also glass and tin foil. The tin foil could be better served with something clear, like the lid to your glass pot. Plastic wrap can work if it is thick enough to withstand the heat generated in the device. 1) Place the cup in the bowl. 2) Fill bowl with water. Do not go over the height of the cup. Less water will distill faster. 3) Cover the bowl. With the lid/tin foil/plastic wrap. 4) Place the still out in an area that receives a lot of sun. This is a solar still at it’s simplest, All you have to do is set it up in a sunny area and come back an hour later. The main drawback is the volume of water treated, in this example you only get a cup of water every few hours. There are additional things you can do to increase the effectiveness and the efficiency. The first thing you can do is add another cup, or two to collect more of the distillate. If your bowl has a lid with a handle in the centre, place the lid on the distiller upside down with the handle pointing into the cup. This should look like a funnel (of sorts) and it will direct more distillate into the cup. Keeping the water shallow will heat it up faster, using a wider bowl or tray will help with this. 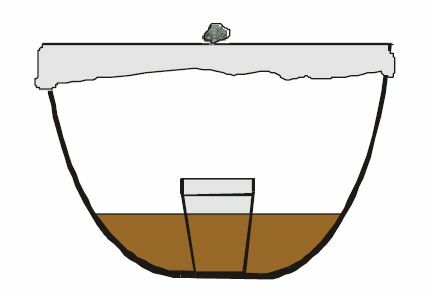 There is a balance however to be kept to ensure the water condenses into the cup, which is favored by a narrow bowl. Placing the still on a black piece of metal will also greatly assist in the heating of the water. You could also place something black and metal in the water or paint the bottom of the bowl. The point is, black surfaces heat up faster. There are specifically designed lab glassware for distillation. If you can buy these, I suggest you do as they will be your most efficient, and can be placed over a flame if you buy the right ones. The piece that is most useful is the condenser tube. The collection of the distilled water is much more efficient with a condenser tube. 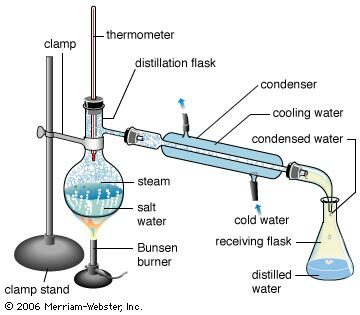 Collecting the distilled water in another container allows for faster distillation due to a rapid drop in temperature from the heated vessel to the cooling vessel. There is only one type of contaminant not removed by distillation, those are volatile chemicals with a boiling point less than water. Volatile chemicals are usually dissolved gasses in the water, they aren’t removed by distillation because these chemicals follow the water through the phase change to a gas and back again into a liquid. Distillation has another big problem in my opinion. Distilled water tastes bad. You may have different tastes than I do, if you do then go ahead and drink distilled water. Now taste is a luxury in a survival situation and drinking bad tasting clean water is better than contaminated water. As I say at the end of all my emergency water treatment articles, always drink the safest water possible. This is another water disinfection tool you can use when you really need it. This week has been really hard for me to be motivated to complete journal entries for The Omega Man Journal. I mean I could have squeezed out SOMETHING, but it wouldn’t have been very good and not many people will have wanted to read it. I personally prefer to have/read good material over filler material. You know; quality over quantity. So yesterday there was no new journal entry, thanks to writers block. At some point yesterday I tweeted “I need some inspiration, Got any to spare?” and I got some very useful ideas from a few people who I met through the #preppertalk hashtag on Twitter. One response from @Prepper_Jeff however threw me for a loop. 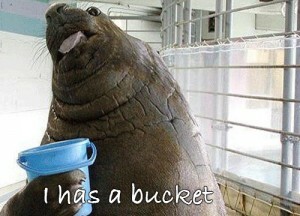 He responded “Here you go… One bucket enough?”. Now the way my brain was working at the time I failed to see what he was referring to and my subsequent misinterpretation is what started my brain working again. He was just offering me some inspiration, not an idea or topic suggestion. I was a little surprised that it worked. Prepper_Jeff however wasn’t surprised, he said that he keep a lot around for just such an occasion.